ripe.io announced today a joint effort with The Cornucopia Project and Analog Devices, Inc. to reimagine the local food supply chain using it’s innovative software and technology stack including blockchain and IoT devices to identify, trace, establish quality and taste profiles of tomatoes. Coordinated through the Cornucopia Project, a non-profit agricultural education organization based in Peterborough, NH, the design and purpose of the collaboration is to expose students from ConVal Regional High School and local famers to innovative tools that can be used alongside existing farming practices enabling improvements in transparency, traceability and quality. The combination of blockchain and IoT devices facilitates accurate real-time monitoring and tracking of the conditions and movement of produce through the food supply chain. The staff of Cornucopia’s Farm to Fork program is training their student farmer “Fellows” on how advanced sensor instrumentation in their fields can provide valuable data to assess the attributes of tomatoes, and how these factors affect taste and quality. The organization will also educate students on how crops can be tracked throughout the agricultural supply chain to support food quality, sustainability, traceability, and nutrition. For the project, Analog Devices is providing a prototype of its crop monitoring solution, which measures environmental factors to help farmers make sound decisions about crops related to irrigation, fertilization, pest management, and harvesting. The sensor-to-cloud, Internet of Things solution enables farmers to make better decisions based on accumulated learning from the persistent monitoring. These 24/7 measurements are combined with a near Infrared (NIR) miniaturized spectrometer that conducts non-destructive analysis of food quality not previously possible at the farm level. Along with private local community support, the endeavor is funded by ripe.io and Analog Devices, with both companies also providing training. Located in San Francisco, CA, ripe.io is introducing the “Blockchain of Food” consisting of an infrastructure of distributed ledgers, IoT and sensors, API’s and connected food supply chain workflow. Our technology provides a distributed, shared system of trust for the food supply chain enabling improved industry collaboration for smarter contracting, transparency for food knowledge, quality and safety for customers, data sharing and validation to improve integrity and reliability. 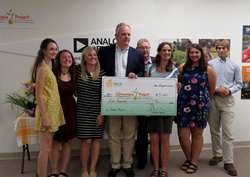 Since 2008, The Cornucopia Project has been dedicated to growing healthy children and communities in the Monadnock Region of southern New Hampshire. They plant the seeds for a healthy future by designing, building, and facilitating garden and agricultural educational programs, committed to growing the next generation of informed food advocates. Visit http://www.cornucopiaproject.org.